Cuba’s communist government will allow unrestricted car imports for the first time in 50 years, marking the end of an era for the 1950s Chevys, Fords and Pontiacs that have survived the ban. It said the decision will gradually allow retail sales of all manner of vehicles – automobiles, vans, trucks and motorcycles – and ends the practice of granting some Cubans special permission to bring in vehicles as a privilege. Holders of the letters, however, will still be first in line to buy cars while the new system is phased in, Granma said. Opening Cuba’s domestic car market to imports is likely to have fateful consequences for the lovingly maintained 1950s cars on the island. But the changes are a long-awaited element of President Raul Castro’s attempts to gradually liberalize Cuba’s Soviet-style [communist] economy. 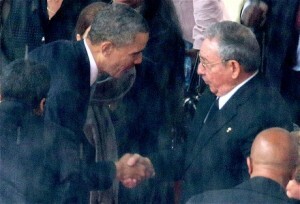 President Obama shakes Raul Castro’s hand. Mr. Obama stopped and shook hands with the Cuban president on his way to the podium December 10 to speak at a memorial in Soweto for the late Nelson Mandela. The handshake was the first between leaders of the two Cold War adversaries since 2000, when then President Bill Clinton shook hands with Fidel at the UN General Assembly in New York. It was only the second time that American and Cuban presidents have shaken hands since the Cuban revolution in 1959. Raul replaced Fidel as Cuba’s president in 2006, but as the father of the communist Cuban revolution the elder Castro remains hugely influential. Approximately ten thousand people have rallied in the center of the Ukrainian capital in the first anti-government protest of the new year. Ex-heavyweight boxing champion Vitali Klitschko encouraged the crowd to continue occupying Kiev’s Independence Square. The protesters oppose President Viktor Yanukovych‘s policy of strengthening ties with Russia rather than the western EU [European Union]. They began a series of rallies in November calling for his resignation. The protests, and occupation of the square by activists, were sparked by Mr. Yanukovych’s decision to abandon plans to sign an association agreement with the European Union. Instead, Ukraine struck a deal with Russia in December, which has seen big cuts in the price of gas imports from Russia. Moscow also supported Ukraine’s finances with a $15 billion purchase of government bonds. Some 10,000 people are estimated to have gathered for this latest rally – considerably fewer than the peak of the campaign in December which saw crowds estimated at 200,000. “The authorities are pretending they cannot hear us. I know it’s hard for us, but we have enough strength to win,” Mr Klitschko told the crowd. He called for renewed demonstrations after the Orthodox Christmas holidays on Monday and Tuesday and warned of a general strike. The last major opposition protest at the end of December was given further impetus by an attack on activist and journalist Tetyana Chornovol, who was severely beaten up on Christmas Day. She had accused Mr. Yanukovych of corruption over his financing of his official residence outside Kiev. Mr. Yanukovych denied any allegation of corruption and called for an investigation into the attack on Ms. Chornovol. A requirement that the Palestinians recognize Israel as a Jewish state has become a major stumbling block in reaching a settlement to the Middle East’s most enduring conflict. As US Secretary of State John Kerry continued a frantic diplomatic quest on Sunday that some have dubbed “mission impossible,” Benjamin Netanyahu, the Israeli prime minister, said Palestinians’ refusal to formally acknowledge the country’s Jewish character had become the key topic in his discussions with Mr Kerry. Palestinian officials admitted that Mr. Kerry has pressed the issue with Mahmoud Abbas, the Palestinian Authority president, who has so far refused to bend. The Palestinian leader believes the rights of Israel’s approximately 1.5 million Arab citizens would be undermined if he concedes the point. It would also weaken the claims of around 5 million refugees and their descendants claiming a “right of return” to homes that are now in Israel, Palestinians argue. Yasser Arafat, the late Palestinian leader, officially recognized Israel before signing the Oslo accords in1993 in a letter to Yitzhak Rabin, the then Israeli prime minister, but did not mention its status as a Jewish state. Mr. Kerry left Israel on Sunday for Jordan and Saudi Arabia, where he was thought to be seeking support for possible Palestinian concessions. Mr. Abbas is thought to be unlikely to give way on key issues without wider Arab support. 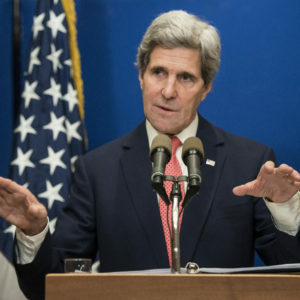 Prime Minister Netanyahu – who was reported to have launched an angry tirade cf complaints to Mr Kerry when the pair met last Thursday – linked the issue to what he said was a campaign of Palestinian incitement against Israel. 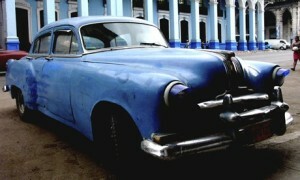 Cuba was the leading importer of North American manufactured cars by the early 1950s. By 1955, the island nation was home to 125,000 Detroit-made cars. Cubans were enamored with the so-called Chariots of Chrome, so much so that the '57 Chevy's debut in Havana--which, astonishingly, came before the car's U.S. premier--attracted a crowd of 40,000. But in 1959, Castro and his Communist revolutionaries seized power in Cuba and immediately set about changing the nation's relationship with America. Castro's regime sought greater communalism and nationalism. His country's love affair with the American car, a symbol of both capitalist success and excess, had to go. The dictator halted all imports of American-made cars. was revoked from then on. From that day on, for the next half century, Cubans would be forced out of both a necessity and a deep sense of nostalgia to meticulously maintain their vehicles. Over 50 years later, in November 2011, the restrictions on the sale of one's personal car would finally be lifted in Cuba. The antique Cadillacs, Chevrolets, and Buicks could suddenly change hands. The United States embargo against Cuba (known in Cuba as el bloqueo) is a commercial, economic, and financial embargo imposed on Cuba by the United States. It began on October 19, 1960 (almost two years after the Batista regime was deposed by the Cuban Revolution) when the US placed an embargo on exports to Cuba (except for food and medicine), and on February 7, 1962 was extended to include almost all imports. The trigger was the government’s decision not to sign a far-reaching partnership deal with the EU, despite years of negotiations aimed at integrating Ukraine with the 28-nation bloc. That decision was announced on 21 November – and it meant that an EU summit with former Soviet states on 28-29 November was a big disappointment for the EU. Thousands of pro-EU Ukrainians poured onto the streets of the capital – on 24 November the crowd was estimated at more than 100,000. They urged President Viktor Yanukovych to cancel his U-turn and go ahead with the EU deal after all. But he refused, and the protests continue. Anger with President Yanukovych has escalated, and now protesters are demanding that he and his government resign. Probably the best-known among them internationally is Vitali Klitschko, a world heavyweight boxing champion turned opposition leader. He heads the Udar (Punch) movement and plans to run for president in 2015. Udar is campaigning for a “modern country with European standards” – that is, loosening ties with Russia and strengthening them with the EU. An ultra-nationalist group called Svoboda (Freedom) is also protesting. Its leader is Oleh Tyahnybok. Between Mr. Tyahnybok and Mr. Klitschko stands Jaroslaw Kaczynski, Poland’s former prime minister and now opposition leader. Historically Poland has vied with Russia for influence in Ukraine. Western Ukraine used to be part of Poland, and cultural and religious ties remain strong (they share the Catholic faith). Most western Ukrainians feel close to the West and suspicious of Russia. Poland is a strong voice in the EU urging the bloc to embrace Ukraine. One of the most important Ukrainian protesters is Arseniy Yatsenyuk, leader of Ukraine’s second biggest party, called Fatherland. He is an ally of Yulia Tymoshenko, a former prime minister now in jail, who is an arch-rival of President Yanukovych. Is Russia keeping President Yanukovych in power? To many observers it looks that way, because Russia exerted strong economic pressure on Ukraine in the run-up to Mr. Yanukovych’s abrupt snub to the EU. Russia took various economic measures – including time-consuming border checks and a ban on Ukrainian sweets – and threatened others. Ukraine is in a long-running dispute with Moscow over the cost of Russian gas, on which it is heavily reliant. Many Ukrainian firms – especially in the country’s Russian-speaking east – also rely on sales to Russia. Mr. Yanukovych still has a strong support base in eastern Ukraine, and there have been street demonstrations by his supporters. The Palestinian Authority is the interim self-government body established to govern the West Bank and Gaza Strip as a consequence of the 1993 Oslo Accords. Originally founded as the Palestinian National Administration, the Fatah- controlled entity transformed itself into the State of Palestine in 2013, after the United Nations voted to recognize Palestine as a non-member UN observer state. Following elections in 2006 and the subsequent Gaza conflict between the Fatah and Hamas parties, its authority has extended only as far as the West Bank. The Palestinian Authority was formed in 1994, pursuant to the Oslo Accords between the Palestine Liberation Organization(PLO) and the government of Israel, as a five-year interim body. Further negotiations were then meant to take place between the two parties regarding its final status. As of 2013, more than eighteen years following the formulation of the Authority, this status has yet to be reached.